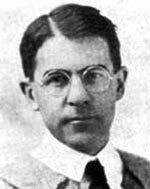 Frank Earle Schoonover was born on August 19th, 1877 in Oxford, NJ, son of Colonel John Schoonover and Elizabeth LaBarre Schoonover. After graduating with honors from the Trenton Model School in 1896, he briefly considered the Presbyterian ministry. However, a Philadelphia Inquirer advertisement for illustration classes steered him to Drexel Institute, where he was accepted into Howard Pyle’s class for aspiring illustrators. Fellow students included Stanley Arthurs, Jessie Wilcox Smith, Elizabeth Shippen Green, and Thornton Oakley. In both 1898 and ’99, Pyle took note of Schoonover’s incipient talents, offering him one of only ten scholarships at his Chadds Ford summer school. By early 1900 the uniquely trained and confident young artist had moved to Wilmington, continuing his studies with Pyle at the mentor’s studios on Franklin Street, launching his career with a commission of four illustrations in the book, A Jersey Boy in the Revolution. Thus began a very successful and prolific artistic career spanning over sixty years, and encompassing approximately 2,200 illustrations for over 130 books and many of the popular magazines and periodicals of the day; Saturday Evening Post, Harpers, Scribners, Outing, American Boy Magazine, Ladies Home Journal, and Colliers, among others. In addition, he completed over three hundred landscapes of the Brandywine and Delaware river valleys primarily after the mid-1930’s, by which time The Golden Age of American Illustration had essentially ended. After 1906, Schoonover’s studio at 1616 N. Rodney Street was the epicenter of this artistic activity. His travels, however, took him to lands far away; Hudson and James Bay (Winter 1903-04), Montana (1905), Europe (1907), the The Canadian frontier again (Summer 1911), New Orleans (1911), Cuba (1936). From these travels, Schoonover gleaned sketches, diaries, and photographs that were the inspiration for many of his paintings of the North American Frontier. He also published several magazine stories recounting these trips, including; ‘The Edge of the Wilderness’, and ‘The Haunts of Jean Lafitte’. His canvases were filled with dramatic images of trappers, Indians, cowboys, and pirates, breaker boys, coal miners, and women in the Pennsylvania Silk Mills. Writers including Jack London, Zane Grey, James Gilbert Parker, Henry Van Dyke, and George Marsh relished the Schoonover illustrations in their books. Schoonover married Martha Culberston in 1911, then ended the decade with a series of fourteen powerful World War One paintings, published in the Ladies Home Journal as The Souvenir Pictures of the Great War. Of his book illustration during the teens, the most notable are those found in the two Burroughs books, Princess of Mars and Gods of Mars. Fifty-three years later he would receive the Edgar Rice Burroughs Bibliophile’s National Award. Throughout the twenties, his book illustration prospered, highlighted by covers for the Harper’s Children’s classics, notably; Kidnapped, Robinson Crusoe, Heidi, Hans Brinker, and Swiss Family Robinson. His other significant contribution to the artistic community was the formation of the Wilmington Sketch Club with fellow illustrator Gayle Hoskins. This later evolved into the Delaware Art Museum of which Schoonover was one of the original founders. Even throughout the thirties, commissions continued for publications like American Boy Magazine, Youths Companion, and Country Gentleman. Schoonover also designed a magnificent series of stained glass windows for Immanuel church, and completed his only mural in 1936 for the H. Fletcher Brown School. Another impressive commission involved two large Pirate compositions for Irenee du Pont’s Cuba estate, Xanadu. They remain there to this day. As the 1930’s closed, and having witnessed the twilight of his illustrative career, Schoonover dedicated his artistic efforts to the landscape of his youth, especially Pike County, where he spent so many summers at the family Bushkill house. He painted actively until the late sixties. By that time he had been honored by a retrospective at the Delaware Art Museum, and been conferred an Honorary Masters of Art Degree by the University of Delaware. He also found time to conduct art classes at his studio for almost thirty years. By the time of his death in 1972, the Delaware Press had acknowledged him as “The Dean of Delaware Artists”. Subsequently, his son, Cortlandt, authored two books celebrating his father’s important contribution to the annuals of American art and illustration; The Edge of the Wilderness, 1974, and Frank E. Schoonover, Illustrator, North American Frontier, 1976. Perhaps the greatest tribute to Schoonover occurred during his first foray into the frozen Canadian north in 1903. The Ojibways he encountered proudly gave him the Indian name; “Miss-a-nog-a-neegan”, the picture making man and made him a blood brother of the tribe.